Perhaps no star’s luminosity glows murkier than Dylan’s in his interviews. 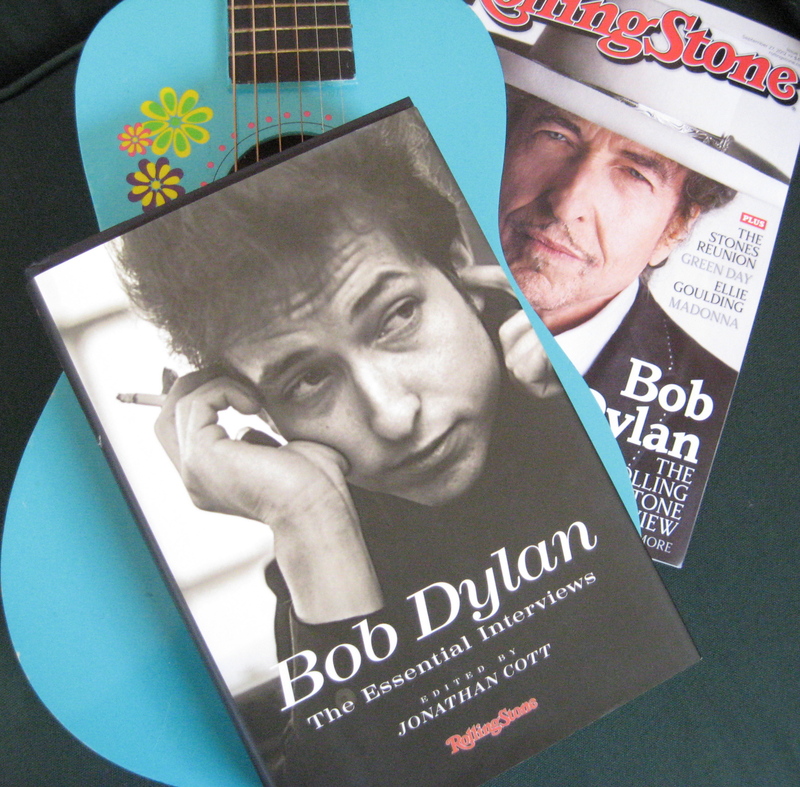 Louis Menand, in “Bob on Bob: Dylan Talks” (New Yorker, 4 Sep 2006), a review of Jonathan Cott’s Bob Dylan: The Essential Interviews, comments on the absurdity of taking any Dylan interview as a gospel light. Menand opens by comparing Dylan’s interviews to Elvis’s, “who was one of the all-time worst.” Dylan is slightly better than Elvis in an interview, Menand argues, where the King’s sole imperative was to not offend, but Dylan “is rarely concerned about sounding polite, and he says things, but he sometimes makes them up. He also contradicts himself, answers questions with questions, rambles, gets hostile, goes laconic, and generally bewilders.” Dylan’s latest interview in Rolling Stone (Issue # 1166, 27 Sep 2012) does all of that and more. But Dylan says he’s trying to explain something that can’t be explained. He asks for some help. 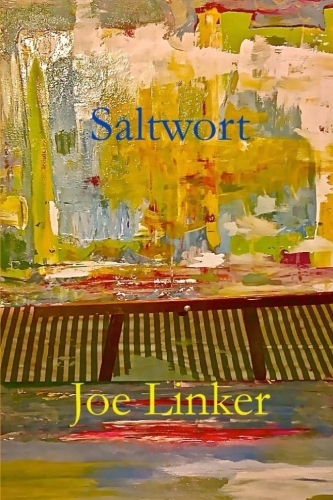 I recalled John Fahey’s 1965 The Transfiguration of Blind Joe Death. Is Dylan talking about being reborn? Surely Dylan is familiar with the great guitarist John Fahey. And this week, reading Clarice Lispector’s Agua Viva, first published in 1973 but recently transfigured by New Directions, and guess what appears – transfiguration: “No, all this isn’t happening in real facts but in the domain of – of an art? yes, of an artifice through which a most delicate reality arises which comes to exist in me: the transfiguration happened to me…I transfigure reality and then another dreaming and sleepwalking reality, creates me” (13:16). Dylan: “Transfiguration is what allows you to crawl out from under the chaos and fly above it. That’s how I can still do what I do and write the songs I sing and just keep on moving” (46). But, “I don’t question myself about my motives,” Lispector says. “I am obscure to myself…I let myself happen” (17). Which is freedom: “Only a few people chosen by the inevitability of chance have tasted the aloof and delicate freedom of life. It’s like knowing how to arrange flowers in a vase: almost useless knowledge. The fleeting freedom of life must never be forgotten: it should be present like a fragrance” (62). On the “only a few,” Dylan seems to agree: “I’m not like you, am I? I’m not like him, either. I’m not like too many others. I’m only like another person who’s been transfigured. How many people like that or like me do you know?” (46). Yet Lispector says, “All lives are heroic lives” (59). And Bloom continues to explain to Molly: “—Metempsychosis, he said, is what the ancient Greeks called it. They used to believe you could be changed into an animal or a tree, for instance. What they called nymphs, for example.” But this begins to sound more like transmogrification. In places, Lispector sounds like Dylan in an interview: “I don’t want to ask why, you can always ask why and always get no answer…What I say to you is never what I say to you but something else instead” (8). But both Dylan and Lispector can strike a point like sinking the nine ball. When asked if performing live is fulfilling, Dylan replies, “No kind of life is fulfilling if your soul hasn’t been redeemed” (48). And Lispector describes her job as looking after the world: “Looking after the world also demands a lot of patience: I have to wait for the day when an ant turns up” (55). Dylan’s discussion of being transfigured reads less bewilderingly if read figuratively. His old self no longer exists. Look homeward, angel, but the transfigured can’t go home again. But enough for now. 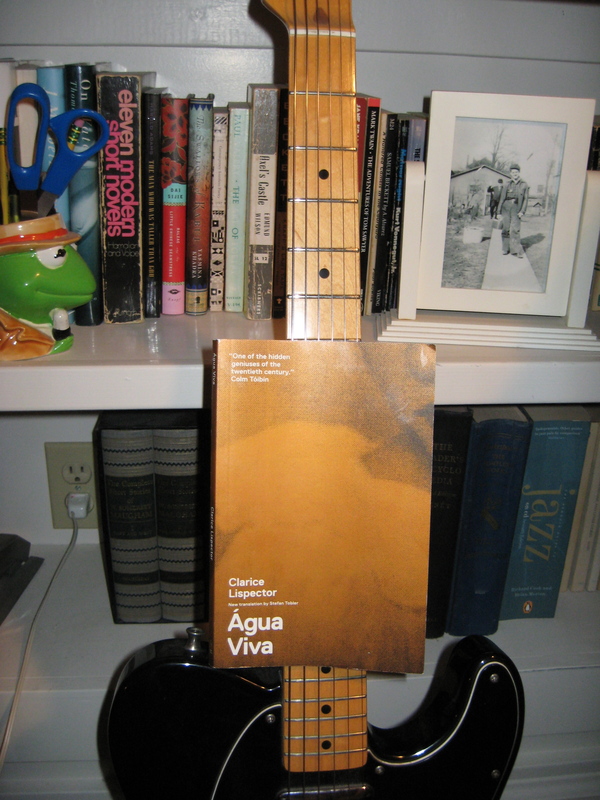 More on Clarice Lispector and Agua Viva soon, but for now, why worry the weary worry why? Next Post New Repost at Berfrois! Overrated and abused, underrated and reused, hyperbolized and underused, understated and overstated, restated and retracted, excused and double-downed, drowned and rusticated, nailed to a wall and drawn on a scroll, ignored and explored, welcomed and turned away, painted and scrawled, yelled and whispered, tattooed and erased, written down and written up, spelled out in the bottom of a tea cup. Ja , just so .